In 2013, KRE Capital LLC, with Dune Real Estate Partners, purchased as DK Las Vegas a portfolio of Las Vegas condominium communities when the economy was still very much in recovery. Four years later as 2017 comes to a close, there is much to celebrate with the record-setting sell-out of one community; the launch of sales at a second in downtown Las Vegas; and fast-paced sales at two other communities, including one near the future NFL Raiders stadium, where the “Raiders effect” tripled the community’s sales velocity in recent months. According to Uri Vaknin, a partner at KRE Capital and turn-around expert who has overseen the communities’ strategic redevelopment, marketing and financing expansion efforts, the reasons for the portfolio’s success vary by property, but sales at all communities are uplifted by the universal appeal of Las Vegas and home prices that are still affordable relative to other markets, the availability of expanded financing options and a trend for buyers of all ages to “right-size” their homes to better accommodate travel and reduce home maintenance. November 2017 was one of the strongest months this year for the portfolio with 23 closings totaling nearly $8 million. According to Vaknin, the portfolio’s downtown communities — The Ogden and Juhl — enjoyed particularly strong sales in October. “Bringing attainable mortgage financing back to the Las Vegas condo market was our foremost goal upon acquiring our Las Vegas portfolio,” Vaknin said. Both The Ogden and Spanish Palms, which is sold out, offer many options, including Federal Housing Administration, Fannie Mae and Veterans Affairs programs. The Ogden is the only condominium tower in Las Vegas since 2008 to obtain Fannie Mae Project Eligibility Review Service project approval. “We are now working to bring those same financing programs to Juhl and One Las Vegas, making homeownership a reality for many who otherwise lack sufficient down payments to qualify for traditional mortgages,” Vaknin said. One Las Vegas was recently awarded conditional Fannie Mae approval with final approval expected next spring when the community reaches a 50 percent sales threshold exclusive of investor sales. And while prices are clearly on the rise here because of high employment and shrinking inventory, backed up by a recent report from Standard &Poor’s CoreLogic Case-Shiller national home price index, Las Vegas is still catching up to many other metropolitan areas that recovered more quickly from the economic downturn, Vaknin said. Spanish Palms at 5220 S. Rainbow Blvd. and Hacienda Boulevard, across the street from Spanish Trail, sold out in summer 2017. In just over two years since DK Las Vegas acquired its Las Vegas portfolio in April 2015, 188 residences were sold. With a sales pace of one home nearly every three days, Spanish Palms easily earned the distinction as the company’s fastest-selling property. On the south end of Las Vegas Boulevard at 8255 Las Vegas Blvd. 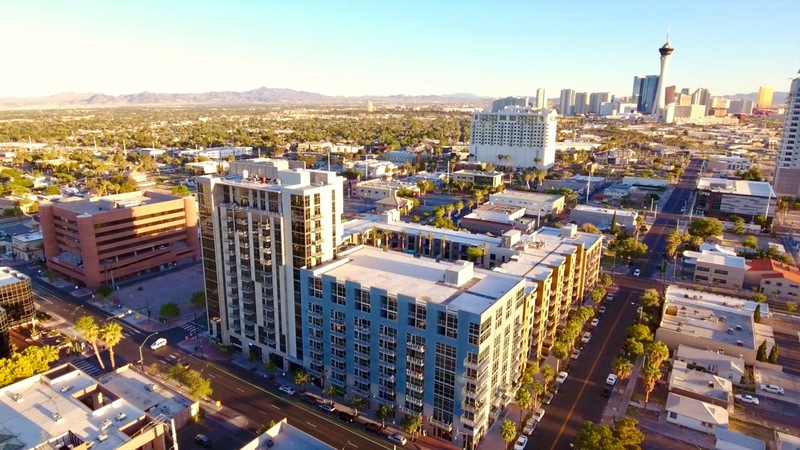 South is One Las Vegas, a twin-tower condominium community less than five miles from the T-Mobile Arena and near the future NFL Raiders stadium. From March to October, 2017, 70-plus condos were sold at One Las Vegas, tripling the community’s previous sales velocity. Vaknin credits the “Raiders effect” in large part for the community’s success, citing several instances in which buyers made the decision to purchase based on the arrival of an NFL team to the city. The Ogden and Juhl are in downtown Las Vegas. According to Vaknin, both communities are attracting buyers of all ages, from millennials to empty-nesters and retirees.